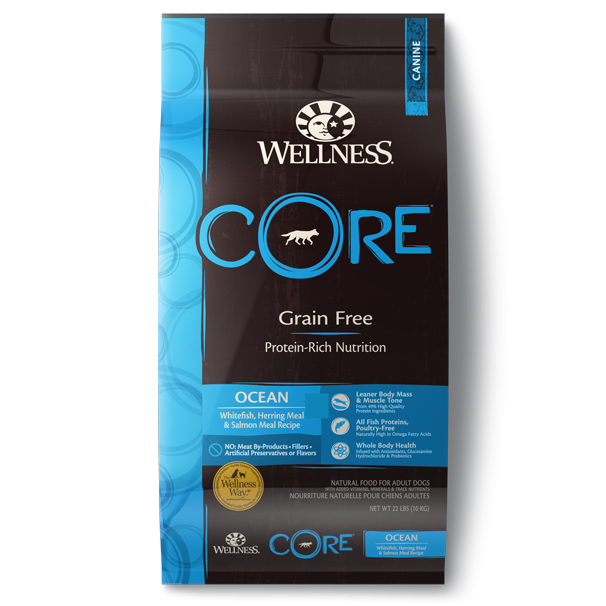 Salmon, Whitefish, Herring, Mackerel, Salmon Broth, Salmon Meal, Sweet Potatoes, Salmon Oil, Canola Oil (preserved with Mixed Tocopherols), Ground Flaxseed, Carrageenan, Guar Gum, Carrots, Apples, Spinach, Parsley, Blueberries, Broccoli, Kale, Chicory Root Extract, Yucca Schidigera Extract, Potassium Chloride, Iron Proteinate, Zinc Proteinate, Vitamin E Supplement, Choline Chloride, Cobalt Proteinate, Copper Proteinate, Thiamine Mononitrate, Manganese Proteinate, Folic Acid, Niacin, Sodium Selenite, d-Calcium Pantothenate, Vitamin D3 Supplement, Pyridoxine Hydrochloride, Riboflavin Supplement, Vitamin A Supplement, Potassium Iodide, Vitamin B12 Supplement, Biotin. 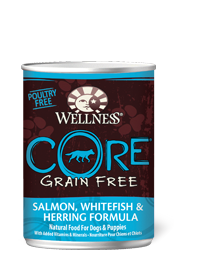 Wellness® CORE® Salmon, Whitefish & Herring Formula Dog Food is formulated to meet the nutritional levels established by the AAFCO Dog Food Nutrient Profiles for all life stages. 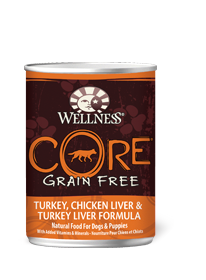 When fed alone to adults feed 170oz per 3lbs of body weight per day, for puppies up to twice this amount and for mothers up to three times this amount. For combination feeding, reduce dry by 36oz for every 1/2 can wet.